Nike launched a print and billboard campaign in England in preparation for Wayne Rooney’s appearance the World Cup game against Sweden. 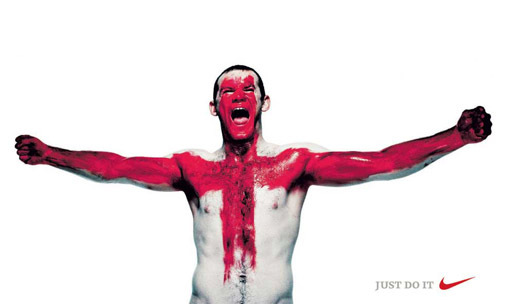 Rooney, star player for Manchester and England, is painted in white, with a red cross splashed across and down his head and naked torso. Responses, apparently, have been mixed. The St George Cross picks up the patriotism of England’s attempt to win the World Cup. Despite Nike’s assurance that there are no religious overtones, some Christians have taken offence that their symbol has been associated with a marketing campaign for Nike, England and football. Of course, since Rooney was red carded for stomping on a Portugese player, the symbolism has backfired for Nike. “Just do it” is not what England had in mind for Rooney’s penalty-inducing behaviour. The ad was developed at Wieden+Kennedy, London, by creative directors Tony Davidson and Kim Papworth, art directors/copywriters Chris Groom and Stuart Harkness, art director/typographer Guy Featherstone, and photographer Nick Georghiou.